What do all three resources have in common this week? Avoidance! Avoiding bad news, avoiding making hard social decisions and avoiding death. Avoidance in all three cases leads to more trouble than it’s worth! Face your fears and check out these offerings. You’ll be glad that you did. When given a choice, most of us shy away from hearing bad news. The Hidden Brain podcast devotes a whole episode to looking at why human brains are “inclined to avoid to avoid information that is painful” even when the information could benefit us. Clearly this behavior is irrational and yet the avoidance of pain is native to brain behavior. Most of us spend a good portion of our days gathering in groups of other people for one reason or another. When these gathering are labeled meetings, chances are our desire to attend these gatherings decreases immediately. 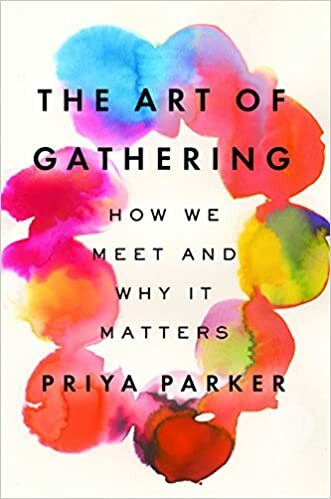 Priya Parker’s book, “The Art of Gathering: How We Meet and Why It Matters” explores what makes all sorts of different forms of gathering not only successful but memorable because they effected some change in those who gathered. Purpose, numbers of participants, spaces, etc. all of have a significant impact on the power of the gathering. As I contemplate the next gathering that I host, I will definitely be thinking about all of the variables that Parker says make for a transformational group experience. Caitlin Doughty has been “obsessed” by death since she was a child. Fortunately for the rest of us, she’s erudite, entertaining, and extremely upbeat about all things pertaining to death. Her video series “Ask A Mortician” aims to answer every possible question that you can think of in regard to corpses, cremation, burial, death practices, etc. She has written two excellent books, “Smoke Gets in Your Eyes,” a memoir of her career as a mortician and her latest book, “From Here to Eternity: Traveling the World to Find the Good Death” which details death practices around the world. I highly recommend both.